Preheat your oven to 375 degrees. Line a baking sheet with parchment paper or leave ungreased. In a large bowl or the bowl of you mixer add the sugars and melted butter and mix well until creamy. Add the eggs, vanilla, baking soda and salt to the bowl and beat on low speed until well incorporated, for about 30 seconds. Add the flour to the bowl and mix until crumbles form. Note that you could mix your flour with the salt and baking soda, but I don't find that it makes a difference at all. Add the chocolate chips to the bowl and use a spatula to mix them in to the dough. You can use a small ice cream scoop to scoop out cookie balls or use your hands to roll out the dough into balls, up to you how big you want your cookies. Place them onto the prepared baking sheet. 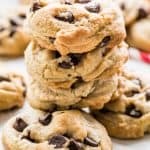 This recipe yields around 50 cookies, so if you can only bake one tray at a time, place the remaining cookie dough in the fridge until ready for the next batch. Repeat with remaining cookie dough. Bake 9 to 11 minutes or until just barely golden around the edges of the cookies. DO NOT OVER BAKE. Let them cool on the baking sheet for about 15 minutes, then transfer them to wire rack to finish cooling or enjoy eating them. Why melt the butter: Melt the butter in the microwave for about 30 to 40 seconds until it's almost entirely melted but not hot. I find that if you just use softened butter the cookies will not spread enough, this way melted butter will give you the perfect cookie every time. Dough too sticky: If you find that the dough is too sticky, add a little bit more flour. You should be able to form it into a ball with your hands but still easy to handle. How do I store them: Store them in an airtight container, and they will stay soft and chewy for about 2 to 3 weeks at room temperature. You can also freeze them in an airtight container, or wrap them in individually, then place them in an airtight container.